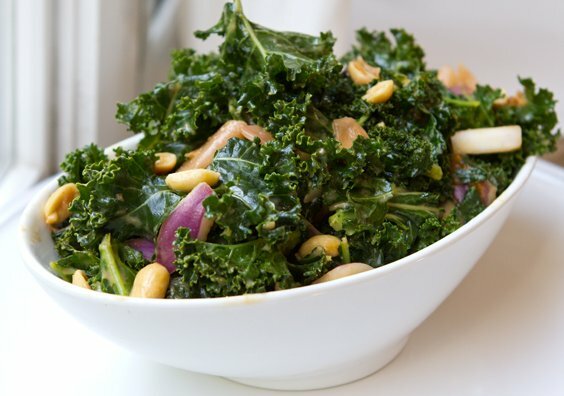 Spicy Peanut Ginger Kale Salad. Cravable Greens. I plowed through three bunches of organic curly green kale this morning in my kale-salad test kitchen. 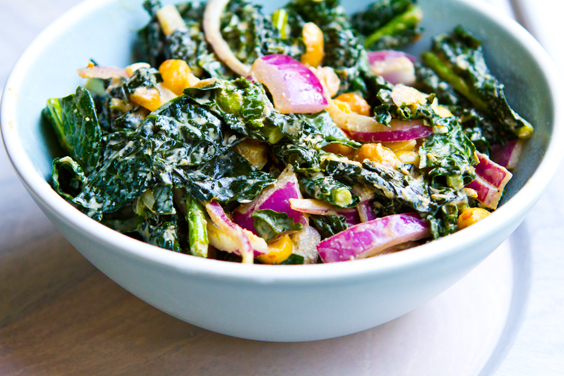 I was putting the final tweaks on my Spicy Peanut Ginger Kale Salad recipe. 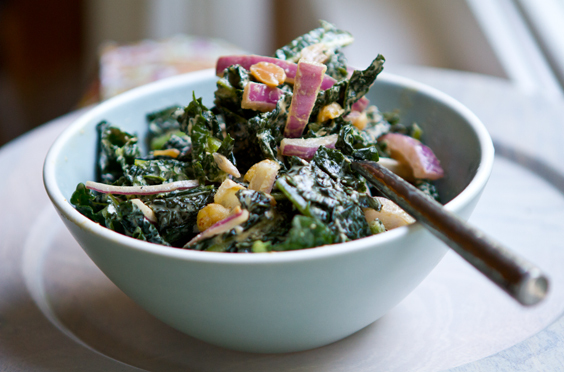 Crafting a super yummy peanut kale salad has been my obsession for the past week. Blame it on M Cafe. One bite of their Spicy Sesame Peanut Chilled Kale Salad and I was hooked. And obsessed with creating my own crunchy peanut, rich sesame-kissed, spicy sweet ginger infused kale salad. And have you noticed how trendy kale has continued to be this year? It has been my go-to green for the past year or so. Kale is loaded with nutrients. Vitamins, minerals, fiber. Super food I crave. My Fully Loaded Kale Salad and Cheezy Kale Chips also feed my kale cravings. 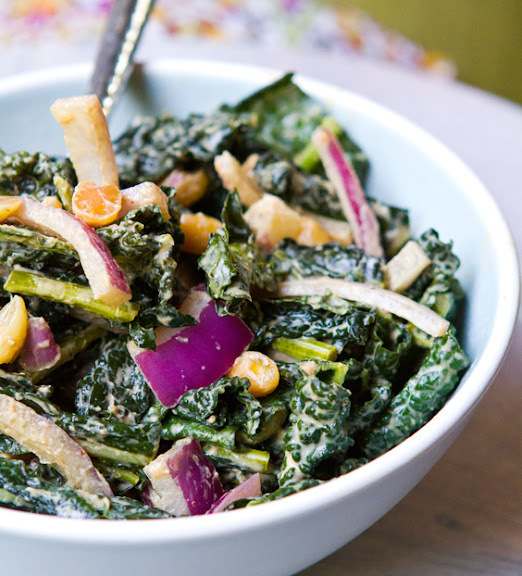 And now this make-it-ahead or eat-it-now peanut kale salad is a new fave. Make it tonight. 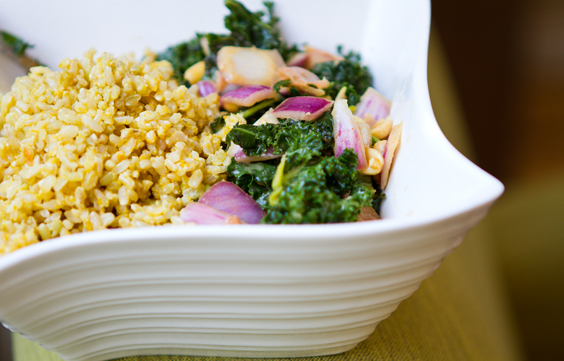 Feed your kale addiction..
Kale Rice Bowl.. Served with cheezy brown rice (nutritional yeast + brown rice) Easy!.. 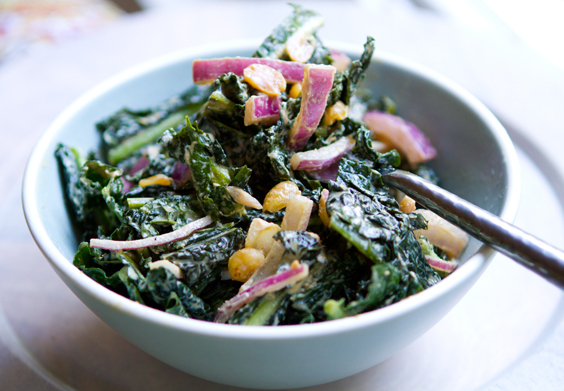 Below shows the same recipe, but with different amounts of dressing and varieties of kale. Customize it. 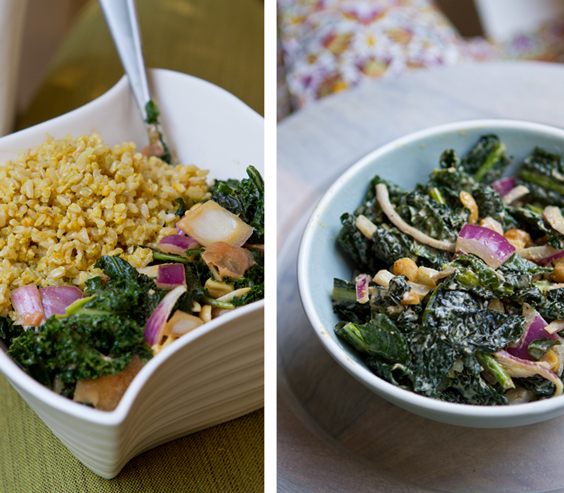 Adjust the dressing, raw-ness and variety of kale to fit your craving. Left is a well marinated dinosaur kale. 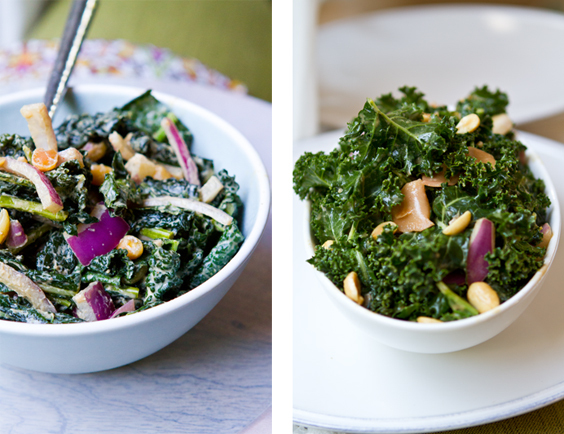 Right is a light and zesty classic crunchy kale. Both delish!.. Kale Nutrition: Kale is rich in fiber, vitamins A, C, K and B6. Minerals manganese, copper, iron and calcium. Fill up on this super duper green food. I love how versatile this salad is. Make it ahead of time and store it in the fridge for a few days for easy grab-and-go munching - or dig into it right after you make it - warm and fluffy. I love this stuff at all hours of the day. Breakfast, lunch, midnight snack. Seriously. That spicy peanut, sweet ginger flavor is cleansing, energizing, satisfying. 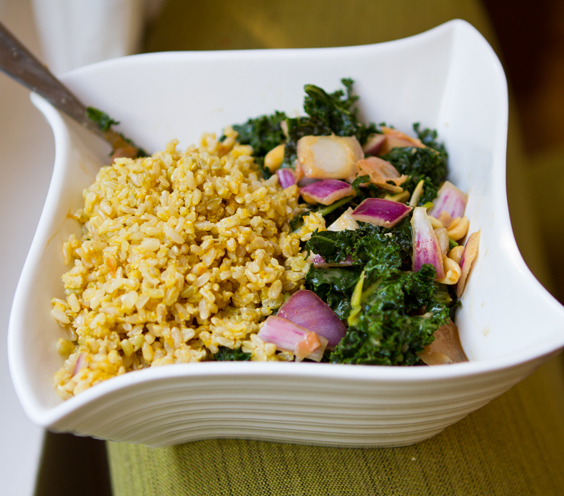 Add some tempeh or tofu with cheezy brown rice for a complete kale-tastic meal. Veggie with Body. The beauty of kale is how well it holds up hours - even days after you make it. Simply store in the fridge. The leaves will soften and become saturated with flavor, but unlike spinach or spring mix greens, the kale won't get overly soggy - just softly wilted. 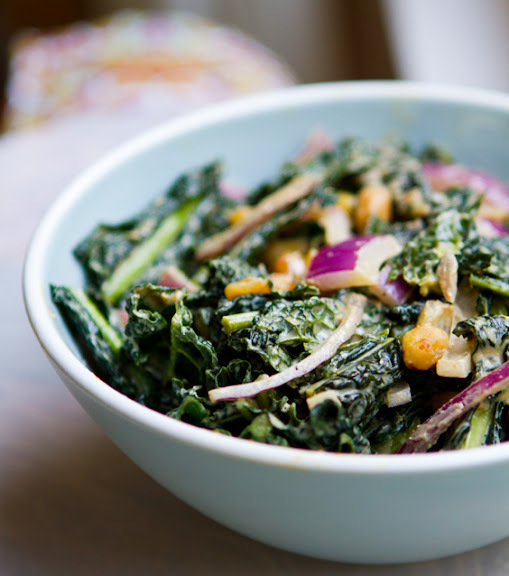 Or use my trick for perfect kale in a flash: chill steamed/wilted kale ahead of time and toss with pre-made peanut sauce (heat to soften) right before eating! This salad may look light on dressing, but it is actually very marinated with flavor!.. 1. Place a large soup pot over med-high heat on your stove top. Add all the sauce ingredients and stir briskly until they melt and blend together. Reduce heat to medium and simmer/stir for about two minutes. Turn heat to low. 2. Pull the leaves in bits from the thick stalks of your kale. Wash if needed. Add the kale leaves (toss thick stems) - add kale to the pot until filled to the brim. Fold the kale into the hot sauce. Fold well. The hot sauce will wilt the kale. 3. Turn off heat and add the remaining amount of kale. Also add in the pickled ginger, peanuts and red onion. Fold the kale salad well for about a minute - until all the kale has wilted and the leaves and onion mixed with the sauce. 4. Serve warm or place in fridge - covered - to chill and serve cold. Will keep well for up to a few days. Notes: Add more cayenne and raw ginger for a spicier salad. If you want a thicker dressed salad - double the sauce recipe and fold as much as you'd like into the kale. You may also want to double the sauce recipe if using more kale and making a larger batch of salad. Really an awesome make-ahead dish! StumbleUpon it! 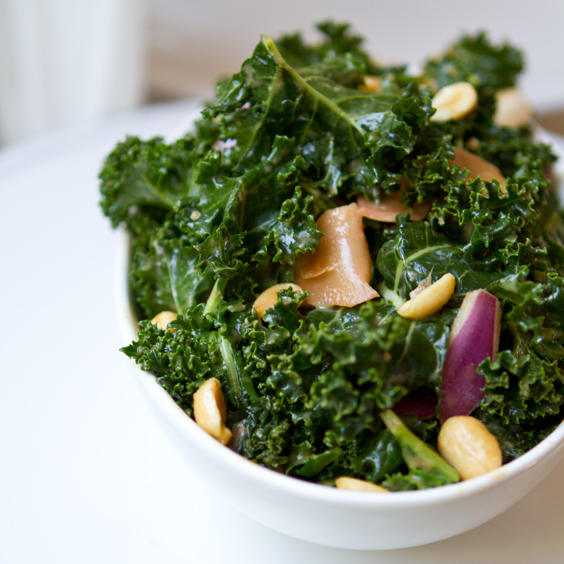 If you are a fan of kale and this Peanut Kale Salad - please show your love by StumblingUpon this post! Button at top.